Figures from ChartCraft’s Investors Intelligence show stock newsletter editors to be similarly bullish to last week: 43.6% bullish and 28.7% bearish. Not only is this little changed from last week, it leaves us mired in a neutral morass which is not really helpful in determining a trend. In contrast, the weekly AAII data is a bit more attention grabbing. As measured by the American Association of Individual Investors, the percentage of US retail investors who are bearish increased by 3% points to 49% and those who are bullish declined by 5% points to just 28%. As you might recall, we saw a record setting AAII bearishness that coincided with the start of the spring rally. This week’s sentiment figures are the most pessimistic since then. While some would interpret this as bullish for the market, it may not be that simple. While sentiment is helpful in pointing out inflection points at extremes, the rest of the time as it meanders it is either not really helpful at all. If you really want to analyze it, sentiment tends to go along with the trend in the market until it tips into a severely lopsided situation. So in fact, while we are not seeing extremes, sentiment can be seen as a guide to confirm a trend, rather than as a contrarian indicator. This is a distinction that makes sentiment much harder to analyze than merely zigging when it zags. Therefore, since the AAII data isn’t at an extreme level of bearishness, we can’t really use it as a contrarian measure. All we can say is that fewer people are bullish, which means that less and less are feeling like putting money to work. That isn’t necessarily great news if you’re bullish. Finally, the Hulbert Stock Newsletter Sentiment Index which is another measure of stock newsletter editor’s stance has fallen from 45.8% early in June 2009 to just 15.8% in recent days. Such a retreat confirms what we are seeing in the other sentiment data (above); bullishness is fading to varying degrees but it is not yet at a point of extreme. Mark Hulbert, the creator and keeper of this sentiment indicator, believes that such a move has contrarian portent because while sentiment has fallen to levels last seen in early April, the market is much higher. 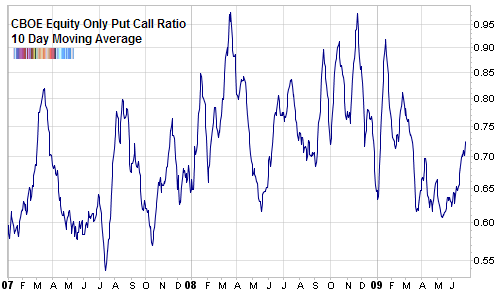 Keep in mind that the put call ratio has a slight upward bias so if you draw a line you can see the connection between the July and October 2007 put call ratio lows - which coincide with the bear market top. While this measure of sentiment has increased in recent weeks, it is a long ways off reaching previous highs of 0.85+. Similar to the CBOE put call ratio, we’ve seen a decrease in bullishness (notice that the ISE is inverted because it is a call put ratio). Since early June 2009, the 10 day moving average has come almost straight down from 181 to 152. But as you can see, it is far from an extreme low. On November 24th, 2008 the 10 day moving average of the equity only ISE call put ratio was 108 and on March 24th, 2008 it was 104. I’d caution you to take all options analysis with a salt lick. 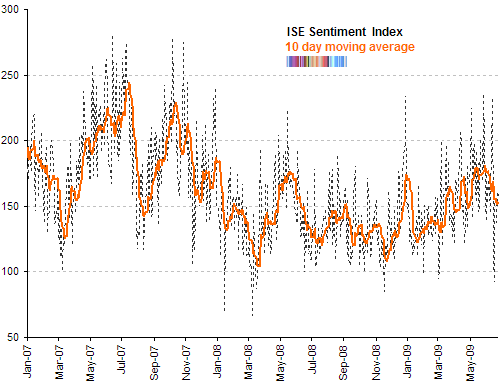 Both the CBOE and ISE data has not conformed to historical ‘norms’ of sentiment analysis during this bear market. For example, notice that neither recognized the March 2009 lows. The CBOE volatility index (VIX) continued its slow, meandering crawl downwards this week. It closed a hair’s breadth below 26, which is the lowest it has been since September 15th 2008. The VIX has fallen off many radars because during this bear market it reached unheard of levels and as a result, what was once considered extreme is now the new ‘normal’. I suspect that it will be a long time until we can put this whole episode behind us and take a look at the VIX the way we used to before. We can be bullish for a while, but I think market is still bearish in the long term. since sentiment is not at an extreme, we’ve been moving sideways. to get it to an extreme we have to either move up to get it there (bullish) or down (bearish), I think the probability of down is higher. Great update on sentiment Babak. I have checked in a few times in the past and find your sentiment work very useful and very complete. Your commentary also sheds light on this highly misunderstood topic. Thank you. Could we not see increasing negativity in the face of a rising market? If that happens, wouldn’t that be bullish? Sorry about the what-ifs. But the disbelief in a rising market seems to be highly overweighted. As a short term phenomena yes, but it can’t really continue. Take a look at what happened in 2003: Even as the market lifted off the March 2003 lows the AAII bearish reading actually increased! Usually what tends to happen though is as the market goes up, sentiment improves… until it reaches a climax and then unwinds. An increasing skepticism could arise even as the market rises. But for a trend to develop you need people who believe in it (to fuel it).